With so many universities and academic institutions from around the world using virtual environments like Second Life for teaching and research, many have started to wonder what, exactly is a virtual classroom? In an environment where you can fly, and with no elements to protect from, what role does architecture play in a virtual university? 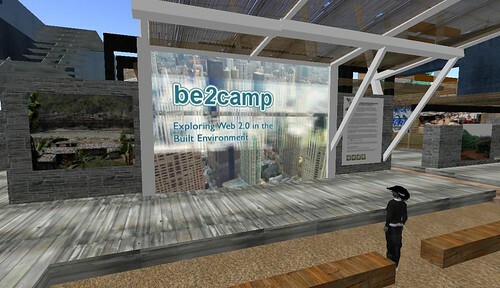 In what ways should a virtual classroom be similar to a classroom in real life? How might they be different? 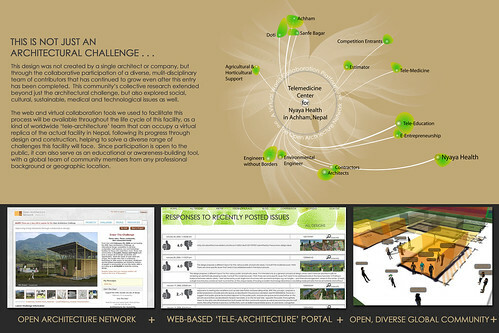 How can the virtual architecture best serve the students, staff and community who use it? Because buildings are so expensive to build and modify in the real world, rarely are students and staff able to actively participate in the creation of the physical spaces they use. In a virtual space, however, the tables are turned. Anyone can easily prototype their idea in 3D, walk through it, and share it with others. Given these new opportunities, why not let the students, staff and public community who actually use these classrooms design it for themselves? Who better, in fact, to offer insight to improve a occupied space, than the people that use it on a daily basis? 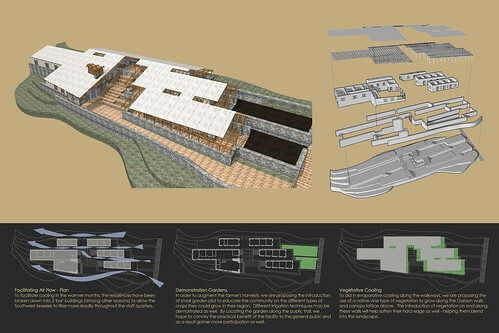 These are the questions, the Studio Wikitecture group has been asking for some time now. 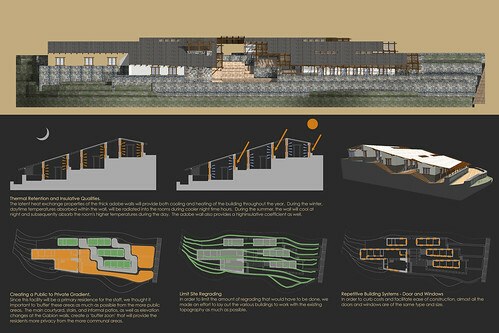 Composed of individuals from various backgrounds and open to anyone, the group has been asking whether new modes of production, as witnessed in the open-source movement, for example, can offer any clues into how we might improve the process of designing our buildings and cities, both real and virtual. 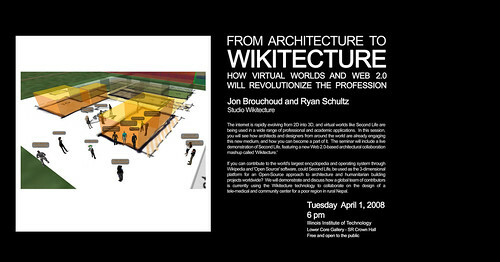 In much the same way Wikipedia enables a loose, self-organizing network of contributors to come together to create a surprisingly accurate encyclopedia, the group has been conducting a number of experiments and projects to explore ways by which a disperse group, spread around the world, can come together to share ideas, edit the contributions of others, and vote on the success or failure of an evolving piece of architecture. Over the years, the group has conducted a number of experiments to flesh out the possibilities of a more decentralized approach to practicing architecture. 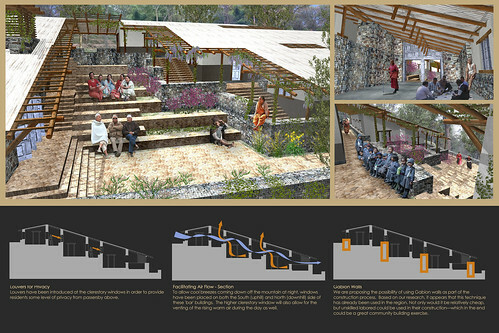 In fact, Studio Wikitecture was recently honored with the Founder’s Award for their collaborative competition entry in last year’s Open Architecture Challenge to design a tele-medicine facility in one of the most remote areas of Western Nepal. 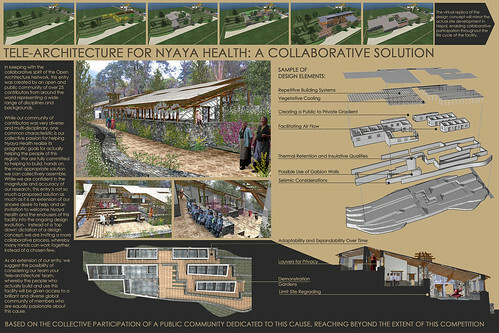 As you can imagine, having a group collaboratively design a building is a daunting and difficult task. 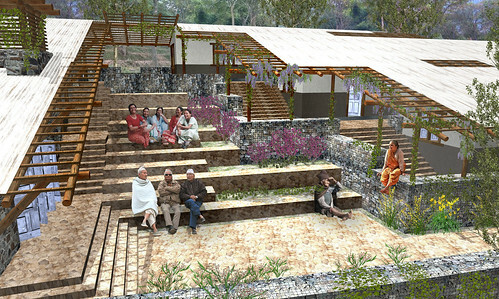 In this light, Studio Wikitecture teamed up with i3dnow to develop a software prototype plug-in for the virtual world of Second Life that helped the group better collaborate on the collectively designed competition entry. The plug-in, in it’s simplest form, is a kind of of 3d-Wiki. The ‘Wiki-Tree’, as it is called, acts very much like a typical wiki, but instead of tracking versions of a text documents, it tracks virtual 3D models and unlike a conventional wiki that conveys submissions in a linear fashion, the ‘Wiki-Tree’ visual conveys, in a sort of 3-dimensional mind map, how the submitted designs iterations relate and ‘branch’ off each other over time. To continue this exploration into open-source architecture, for the group’s 4th project, the University of Alabama has challenged you, its students and staff, to collectively brainstorm and design a virtual set of classrooms. 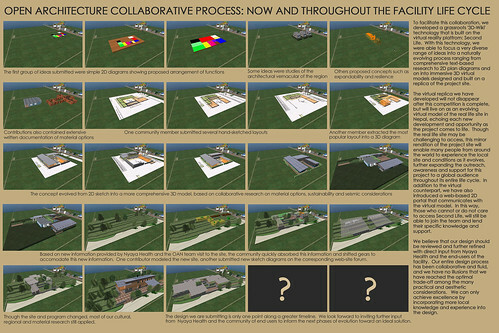 Through this project, you will be working in close collaboration with both your professors and/or peers to design a series of classrooms in the virtual realm. Furthermore, you and your fellow contributors will be awarded at total of $250,000 Linden dollars, distributed based on a unique ‘Community Assessment’ method. A method, whereby members of the community collectively determine the approximate percentage of credit each contributor deserves. As with the last project, we will be using the 3d-Wiki versioning tool to keep track your and your fellow contributor’s design submissions. Through the ‘Wiki-Tree’, you will be able to review the various designs submitted, as well comment and vote on your preferences (or dislikes). As an overview, this video will give you a really quick sense on how the ‘Wiki-Tree’ works. To participate, you’ll need to create a Second Life account HERE if you don’t have one already, then join the Studio Wikitecture group (in Second Life, click Search at the bottom). Then visit the University’s virtual site HERE (UA ESPRMC sim, 186, 87, 26), and click on the base of the Wiki-tree in order to register your avatar and get a password. This password will then give you access to the website component HERE, where you’ll be able to vote and comment on ideas submitted by the community. In an effort to keep the project as open as possible and avoid hindering creativity, the following are the only guidelines to the project. 1. 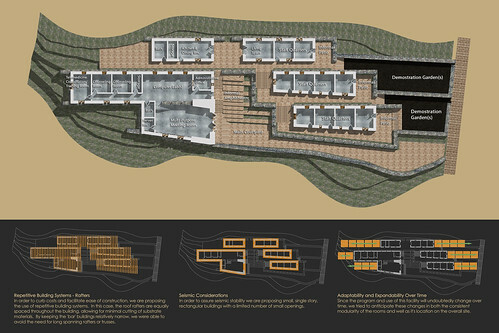 The architectural style is open to the group’s discretion. 3. The disciplines we may house in the rooms include: Science, Mathematics, Art, English, Social Sciences, and Music. We will also be holding regular tutorial sessions every Tuesday at 5pm SL-time, and at times requested by the community, for anyone who has questions or needs help submitting their idea. Ryan Schultz (Theory Shaw in SL): (ryan.schultz [at] studiowikitecture [dot] com). Jon Brouchoud (Keystone Bouchard in SL): (jon.brouchoud [at] studiowikitecture [dot] com).